As the dawn set, the view out side the bus window started to become clear, and with it came the realization that we were passing through a land which had no trees and was much like a barren desert.Yes, it was a desert, the only difference being that it was a high altitude one with the average height being 3500 meters. I had taken a bus from ISBT, Delhi which had displayed a board saying Delhi - Leh. As the place reveled itself all the descriptions about the place in various publications started to fall in place. Ladakh is a remote land located in the eastern part of modern day J & K. With in India it resembles with the Lahoul & Spiti of Himachal and it resembles Tibetan plateau totally. It's a fascinating place as no other in the Country, a truly high land desert, lying beyond the mighty Himalaya. The Himalaya serves as a barrier to the rain bearing clouds, resulting in a barren, tree less landscape. The mountain ranges are devoid of any vegetation and the higher ones are toped with snow. The land in the valleys nearer to the rivers/ streams and the fields which are irrigated with the help of miles long channels are an oasis of green. The contrast is there to be seen to be believed. The Indus river flows through the land and many villages are located along it. 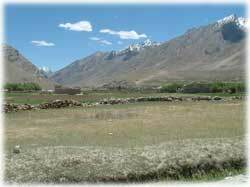 In the north the land is quite fertile thanks to another two great rivers, namely the Shyok and Nubra. Another feature of the land are the great plains which run for km on end. These are not to be seen in other mountainous regions of the country. The mountain ranges running parallel on both sides of the river Indus defines the topography. In the north are the harsh Eastern Karakoram from which the Shyok and Nubra rivers flow, giving rise to the fertile Nubra valley.On one side of Indus is the Ladakh range which rises from the left bank of the Shyok river and on the other side is the Zanskar range. The Zanskar range rises east of Kargil and forms a plateau over Rupshu in South- Eastern Ladakh finally continuing into Tibet. The mighty Himalaya form the southern boundary of the land. The precipitation is very low in Ladakh and as such the snow line is quite high. The air is completely dry and oxygen levels quite low in comparison to other places of same height, due to lack of vegetation. 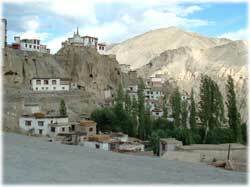 The main town of Ladakh, Leh (3500 meter) is about 10 km north-east of the Indus. From the town up to the river, the landscape is almost completely barren. Leh has been at the cross roads of the various civilizations being on the main caravan route from the central Asia. The town has a large military presence. There are a number of interesting places to visit in and around this fascinating town. A trip down the winding lanes of the old city are like taking a trip down the history of the city. 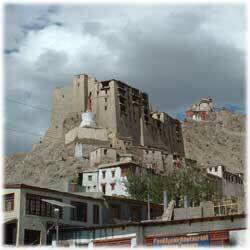 At one time Leh was a major stopping point on the Asian 'silk route' and a commercial capital in its own right. 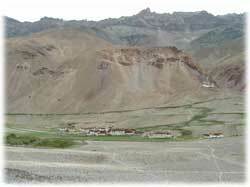 Padum is the main town of the Zanskar region of Ladakh. Padum is a small town which boosts of a fair weather road connection to Kargil. The road is quite rough and closes down every winter due to snow. The the only link with the outside world is through the frozen river Zanskar. The town has just a few shops and a single hotel. The vegetables are available as and when received from Kargil. The prices are fixed for all the shops and rate lists displayed prominently. Telephone booths are missing and so don't expect to be able to get in touch with outside civilization once you reach Padum. 1 Darcha Padum 19 days. Details. Copyright © by Himalayan Camping All Right Reserved. Himalayan Camping Copyright @ Feb 2005. All Rights Reserved.